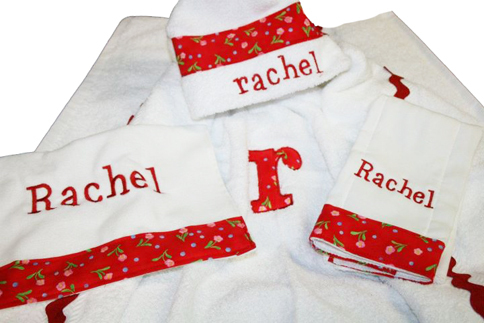 Each hooded towel comes complete with embroidery and/or monogramming. Our hooded towels are 100% cotton and measure 51" x 29.5". They are made from a full sized bath towel and I hand sew on a wash cloth to complete the hood. They are soft and will be treasured for years to come. You are purchasing the towel you see shown, with the exception of fabric choice. We have 1000's of different fabrics available. All fabric is not available at all times. We will substitute something just as amazing when necessary. Your thread color choice will determine the colors of the fabrics we choose for you to be sure they compliment each other. Fabric Choice for Hood Floral Gingham Seersucker Checked Stripes Houndstooth Polka Dots Geometric Shapes Sports Surprise Me! !